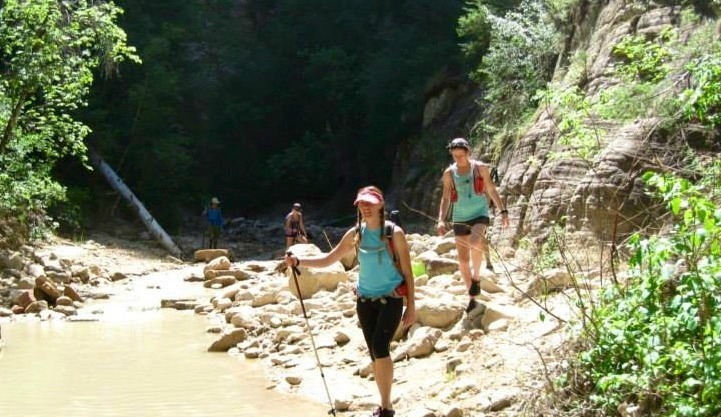 ST. GEORGE — Zion National Park is known for its magnificent hiking trails, but currently one of its most popular hikes —The Narrows — is closed due to high water levels from heavy rainfall. The closure affects all routes that exit through The Narrows, according to an alert issued by the National Park Service Saturday. The area will remain closed until the water level drops below 150 cubic feet per second and remains there for 24 hours, which could possibly be delayed as more rain is expected Sunday. Water level fluctuates greatly from year to year and day to day depending on many factors, such as rainfall and snow melt. When the river is running below 70 cubic feet per second, walking in The Narrows is moderately difficult, with knee-deep crossings on the slippery and uneven river bottom and frequent pools up to waist deep. When the current goes above 70 cubic feet per second, walking against the current becomes challenging and crossings of mid-thigh deep water are frequent, with pools that can be chest-deep. Once the flow goes over 150 cubic feet per second, The Narrows is closed to all travel. One of the most popular areas in the park, the Narrows surrounds hikers by sandstone walls thousands of feet tall as they walk along the Virgin River through the narrow gorge, the width of which narrows to only 20-30 feet at points. Updates on the closure and current conditions can be found on Zion National Park’s twitter feed.